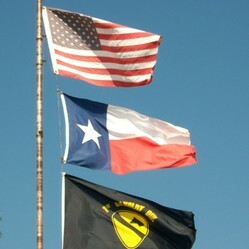 For a durable United States flag to fly 24 hours a day, choose the Tough-Tex flag by Annin Flagmakers. It is high quality and made in the USA, by Americans! I have had a flagpole in my front yard since 1994, and proudly flown United States, Texas and military flags the entire time. While some people only fly their flags on national holidays, it's important to me to show my patriotism and love for the United States of America every day. I live in the plains of Texas, which is a high-wind area of the state. The sun shines most days, and the temperatures can get up into the 90s and 100s during the summer. I need durable, high quality flags that not only look good, but can stand up to the extremes here in Texas. At first, I purchased the cheaper, nylon flags. While they have more vibrant colors than their polyester counterparts, the nylon American flags frayed within a month! As the saying goes "You get what you pay for", so I started searching for better quality flags. My first polyester U.S. flag was purchased in a discount store. I was surprised at the cost, as it was almost $15.00 more than the nylon flags. While it lasted longer than the nylon ones, it still wasn't up to par. It didn't have reinforced grommets, so it tore when the winds got high. The next flag I purchased was online, and I really liked it. That is, until I read the tag that said "Made in China". An American flag needs to be made by Americans! For my next purchase, I decided I needed to do more research. I visited a lot of websites, got recommendations from friends, and finally purchased my first Annin Tough-Tex American flag. Annin Flagmakers are the oldest and largest manufacturer of flags in the United States. They are family owned and operated, and have been in business since 1847. They employ over 500 U.S. citizens, and take pride in the quality of their products. 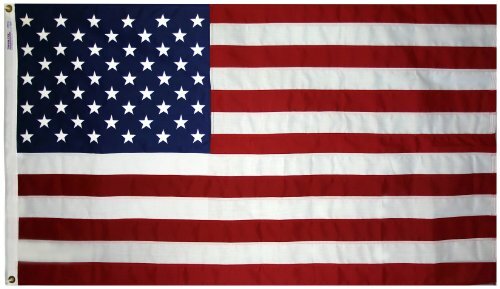 What I really like about this company is that they are dedicated to manufacturing United States flags, in America, by Americans, with American-made fabric. Annin Flagmakers was inducted into the Made in the USA Foundation's Hall of Fame in 2011. The Hall of Fame honors companies who employ United States citizens; manufacture American products; abide by strict labor and environmental standards; and promote American-made products. Made In The USA by Annin Flagmakers! I have purchased several of these Tough-Tex American flags over the years. They are of the highest quality, and most importantly, made in the USA! These American flags are made of 100% polyester, and woven in such a way that the high winds move through them. While all flags will eventually fray, these American flags are much stronger than the lesser-quality nylon flags. The stripes are sewn individually, and the stars are embroidered. There is even double-stitching around the edges! The colors are bright, and the company offers a 1-year colorfast guarantee. They come with brass grommets, so you can attach them to your pole with clips. Because of their consistent high quality, the Tough-Tex flag will be the only U.S. flag I purchase from now on. If you want a high quality American flag, made in the USA, that will last a long time, I highly recommend you purchase one of these. Draped the casket of President Abraham Lincoln. Been placed on the moon by Neil Armstrong during NASA's Apollo 11 lunar landing mission in 1969! Annin is the official flag maker for the Flag of Honor, Flag of Heroes Project. These are the flags that were created to honor and remember the victims of the terrorist attacks of September 11, 2001. These are a great size to put out around your house or lawn. They are also good to put out at military gravesites. I usually keep a dozen or more of these on hand for quick decorating ideas. I fly these POW -MIA flags below my US and Texas flags. While they are not the same quality as the Tough Tex American flag, they are good quality for the price. Annin also manufactures international flags for those of you who live in countries other than the United States. If you need a British flag, a Canadian flag, or even a flag for France, they can set you up! Just go to Annin's Flags on Amazon, and see all the great flags that they offer. Do you fly a flag or decorate for national holidays? Please share the ways you show your patriotism and love for your country!